August 13 is the 225th day of the year(226th in leap years) in the Gregorian calendar.There are 140 days remaining until the end of the year. 1532 – Union of Brittany and France: The Duchy of Brittany is absorbed into the Kingdom of France. Year 29 BC was either a common year starting on Friday or Saturday or a leap year starting on Thursday, Friday or Saturday of the Julian calendar and a leap year starting on Thursday of the Proleptic Julian calendar. At the time, it was known as the Year of the Consulship of Octavian and Appuleius. The denomination 29 BC for this year has been used since the early medieval period, when the Anno Domini calendar era became the prevalent method in Europe for naming years. 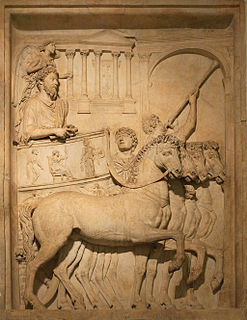 The Roman triumph was a civil ceremony and religious rite of ancient Rome, held to publicly celebrate and sanctify the success of a military commander who had led Roman forces to victory in the service of the state or, originally and traditionally, one who had successfully completed a foreign war. In historiography, ancient Rome is Roman civilization from the founding of the city of Rome in the 8th century BC to the collapse of the Western Roman Empire in the 5th century AD, encompassing the Roman Kingdom, Roman Republic and Roman Empire until the fall of the western empire. The civilization began as an Italic settlement in the Italian peninsula, dating from the 8th century BC, that grew into the city of Rome and which subsequently gave its name to the empire over which it ruled and to the widespread civilisation the empire developed. The Roman empire expanded to become one of the largest empires in the ancient world, though still ruled from the city, with an estimated 50 to 90 million inhabitants and covering 5.0 million square kilometres at its height in AD 117. Year 985 (CMLXXXV) was a common year starting on Thursday of the Julian calendar. Abū ʿAlī Manṣūr, better known by his regnal title al-Ḥākim bi-Amr Allāh, was the sixth Fatimid caliph and 16th Ismaili imam (996–1021). Al-Hakim is an important figure in a number of Shia Ismaili religions, such as the world's 15 million Nizaris, in addition to the 2 million Druze of the Levant whose eponymous founder ad-Darazi proclaimed him as the incarnation of God in 1018. Year 1311 (MCCCXI) was a common year starting on Friday of the Julian calendar. Year 587 (DLXXXVII) was a common year starting on Wednesday of the Julian calendar. The denomination 587 for this year has been used since the early medieval period, when the Anno Domini calendar era became the prevalent method in Europe for naming years. Radegund was a Thuringian princess and Frankish queen, who founded the Abbey of the Holy Cross at Poitiers. She is the patron saint of several churches in France and England and of Jesus College, Cambridge. Year 604 (DCIV) was a leap year starting on Wednesday of the Julian calendar. The denomination 604 for this year has been used since the early medieval period, when the Anno Domini calendar era became the prevalent method in Europe for naming years. Saints Centola and Helen were, according to Christian tradition, two women who were martyred at Burgos in 304 AD during the persecution of Christians by Diocletian. Cassian, or Saint Cassian of Imola, or Cassius was a Christian saint of the 4th century. Benedetto Sinigardi, also known as Fra Benedetto di Arezzo or Sinigardi di Arezzo was a Franciscan friar, and is considered to be the author of the Angelus prayer. Benildus Romançon, F.S.C., was a French schoolteacher and member of the Brothers of the Christian Schools who has been declared a saint by the Catholic Church. His feast day is August 13. August 14 is the 226th day of the year in the Gregorian calendar. There are 139 days remaining until the end of the year. May 27 is the 147th day of the year in the Gregorian calendar. There are 218 days remaining until the end of the year. October 6 is the 279th day of the year in the Gregorian calendar. There are 86 days remaining until the end of the year. ↑ "History of the Coldstream Guards". Archived from the original on 6 September 2013. Retrieved 26 April 2014. ↑ "Coin-controlled apparatus for telephones" (PDF). google.com. Retrieved 13 August 2017. ↑ "Construction of the Berlin Wall". Berlin.de. Retrieved 12 August 2017. ↑ Olsen, Jack (1996). Night of the grizzlies. Moose, Wyo. : Homestead Pub. ISBN 0-943972-48-5. ↑ Taylor, Alan (July 15, 2014). "The Year Men Walked on the Moon". The Atlantic. Retrieved October 24, 2017. ↑ "Richard Nixon: Remarks at a Dinner in Los Angeles Honoring the Apollo 11 Astronauts". The American Presidency Project. August 13, 1969. Retrieved October 24, 2017. ↑ "Margaret Tafoya". CLARA Database of Women Artists. ↑ Times, Joseph B. Treaster and Special To the New York. "Woman in the News; Firm Leader For Haitians Ertha Pascal-Trouillot" . Retrieved 2018-05-24. ↑ "Jane Carr". British Film Institute. 2018. Retrieved 18 August 2018. ↑ "Muldowneyville: Profile". muldowneyville.tripod.com. Retrieved 2018-04-12. ↑ "Entry List by NOC". a.longinestiming.com. Retrieved 7 June 2018. ↑ Pradesh (India), Madhya (1827). Madhya Pradesh District Gazetteers: Hoshangabad. Government Central Press. p. 64. ↑ "Jim 'The Anvil' Neidhart dies". canoe.com. Retrieved August 13, 2018. Wikimedia Commons has media related to August 13 .